You can download many of the live recordings we are playing on 24hourkirtan.fm from our download section. Some Kirtans are not available in our download section, because some event organizers are raising funds for the production of first class recordings. Radhadesh Mellows e.g. is a free event and would not be possible otherwise. If you listen to our live stream, you will also hear the most recent recordings which are not publicly available in our MP3 archive. It is also possible to support 24 Hour Kirtan Radio by buying our most recent recordings in our online store as a digital download or as various MP3 DVDs. you have no aditi priya pr’s kirtan. Where can we find recordings of his kirtans? Do you have kirtan by Sacidevi dasi? Not yet. If you tell us where we can download them we would be happy to add them. Thanks for sharing Sacidevi’s MP3s, Shekhar Prabhu. Do you have any non-studio recordings of her singing live kirtan? dandavat pranam to you all.Thanks for this glorious website. Where i can find kirtans from Kirtan Mela Germany 2013? We will add them in the next couple of weeks. Haven’t received the CD from the organizer, but underway. Unable to Download Kirtan Mela Mumbai 2013. It is not available for download as per request by the organizers of the mela. Please contact them directly if you are interested in buying the MP3 CDs. Radhadesh Mellows 2012 folder is inaccessible. Kindly check & fix it. The 2012 recordings are not free to download. Please go to http://radhadeshmellows.com/recordings for more information. Hare Krishna! Provide a link to this track Uttam Bhakta Prabhu – Kirtan Festival Mumbai Sri Krishna Chaitanya in 2013. Thank you so much! It’s just such a nectar !! As it can be downloaded? Now Playing: Acyuta Gopi – Radhadesh Mellows 2014 Track 20 I listen and ecstatic !!! I somehow missed your comments from February. Kirtan Festival Mumbai and Radhadesh Mellows are restricted, because of the festival organizer. You need to either contact them directly or become a member of 24 Hour Kirtan Radio do be able to download them. Hare Krishna! Tell me, I understand. now free to download from your site is nothing impossible? That is, it turns out that the holy name- Mahamantra is now sold for money? Can you imagine Lord Chaitanya, who would sit and sold holy name instead of what would have to go and sing it in all towns and villages? Lord Chaitanya’s mission was to give each of the holy name, and he did not ask for it, no one money. Is Kali Yuga because you act that simple truth somewhere away from you? Can you imagine how Chaitanya in a jacket with a laptop calculates its profit for the distribution of the holy name? What would you say to that Prabhupada? Should we expect that on line esters have also become paid? We are still migrating our media archive to a new server and once completed will continue to offer over 95% of all kirtans played on the radio station as free downloads as before, i.e. over 50 GB of MP3s. We’re going to store the files on Google’s cloud platform, so the downloads will be lighting fast for everyone around the world. Are you aware that it costs laxmi to offer all those kirtans as free downloads? 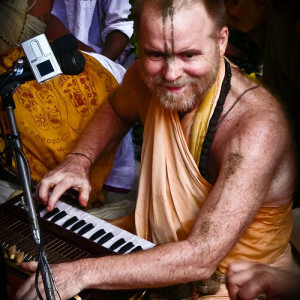 In the meantime you can download Aindra prabhu’s kirtans for free from http://24hourkirtan.com. The remaining 5% that are not offered as free downloads cannot be bought, but you can download them from the same lighting fast cloud platform for a donation or by becoming a member of 24 Hour Kirtan Radio which does not require you to pay anything, either, if you select the Krishna Balaram membership. You see, there are lots of options and we hope that you can see that we’re not trying to make money with our efforts in order to enrich ourselves. 24 Hour Kirtan Radio is a Swiss non-profit organization. how to become a member of the 24 Hour Kirtan Radio? I had recently heard an online radio stream of kirtan by HG Govind Prabhu ,titled ”GOVIND KBM 16.08.2015” . I was really moved by the melodious exhibition of this particular kirtan . Can I procure it from some way, by any mechanism by your mercy prji? . Please help me get this kirtan . Your magnanimity for the same will always be revered by me. Dandavat pranam. All 2015 recordings from Krishna Balaram Mandir will be added to http://24hourkirtan.com anytime soon. In the meantime, I’ve uploaded this particular recording to our SoundCloud https://soundcloud.com/24hourkirtan/govinda-krishna-balaram-mandir-2015. We play this channel 24 hours at our home. Thank you so much, this is amazing service. I heard a kirtan about 1 nd half hours back and i wish to download it. It was playing at 3:30 am pacific time on 1st aug 2017. Couldn’t find much details about the track. Please help in getting the recording. Hope you are able to find it by time nd date.